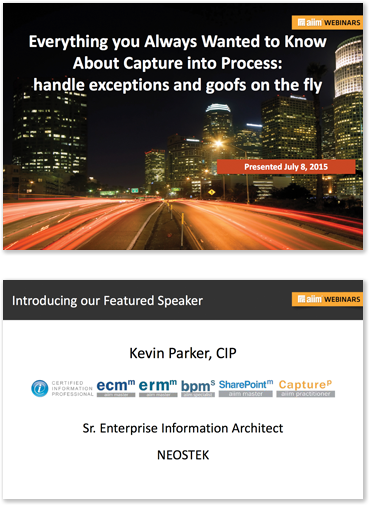 On Wednesday, July 8, 2015, NEOSTEK’s Kevin Parker, CIP was the featured speaker for an AIIM Webinar on information capture. AIIM (Association for Information and Image Management) is the global community of information professionals. Capture today is far more than scanning and mailroom automation; more than being a trigger for workflows and processes in the organization. Capture applications must quickly and more accurately get all the information and data directly into your back-end processes. But what about mis-steps, mis-queues, and exceptions in the capture cycle process? In this webinar, we’ll discuss why it’s so important to quickly identify and recover from exceptions within the capture cycle process. We’ll point out where mis-steps and mis-queues are most likely to occur, and offer tips and suggestions on how to mitigate them efficiently and effectively. Succeed here and you’ll quickly reduce your capture process business cycle times – improving your overall productivity, system efficiencies and a true measure of ROI. NEOSTEK, Inc. provides Information Technology services to U.S. Government clients. We are experts at enterprise information management through the entire information lifecycle. Let us know how we can help you!